Every year during Advent, Grace reaches out to local families who are going through rough times. Most years we work through the Salvation Army’s Christmas family program, and sponsor two or three families. 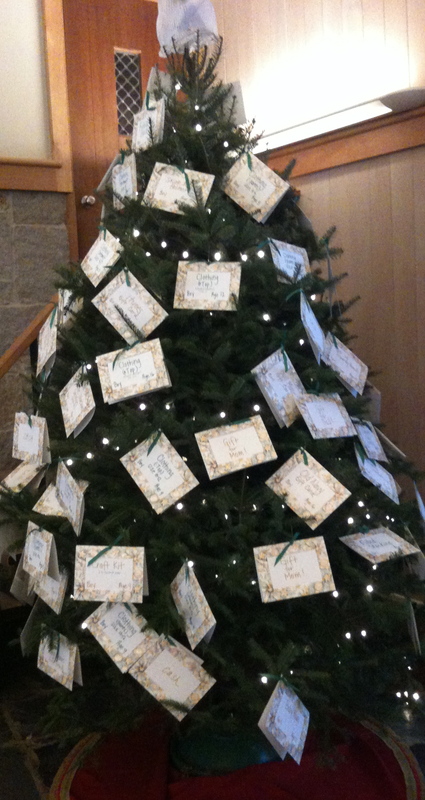 Each family gives us an idea of what would be most welcome on Christmas morning, and then we go to work: the Giving Tree in our entrance hall is decorated with cards, each one inviting a specific gift. Parishioners take cards, and return them with gifts in plenty of time for them to be discreetly delivered in advance of Christmas. This past Christmas, the children of Children’s Church used some of the offerings they had been making through the year to buy and fill Christmas stockings!